Many dog owners believe that a raw food diet for dogs is healthiest. They think this natural diet offers more to their dog than commercial dog food and cooked meat. And so they feed their dogs only bones and raw food. The popularity of this raw dog food diet has grown significantly over the last few years. The idea behind the raw food diet for dogs is that it more closely matches the natural diet that wild dogs have. And, according to the theory, if you feed your dog a raw diet, they’re likely to be healthier, have better teeth, coat, toilet habits, and overall more energy. The raw food diet is especially good for dogs that need to lose weight, are often sick, or have skin, coat or joint problems. If your dog meets one or more of these criteria and you’d like to help them, then a raw food diet is something that’s worth considering. In particular, if your dog has allergies to certain foods, you can be sure of avoiding them if you prepare all your dog’s own raw food yourself. And of course, if the raw food diet does help your dog, it can also help your pocket as it can save you a small fortune in vet’s fees! Bones are often included in a raw food diet for dogs – the so-called BARF (bones and raw food) diet. 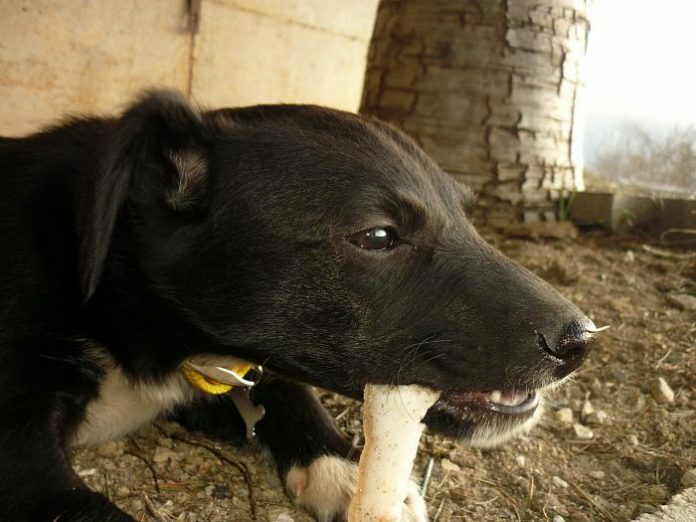 Chewing on the bones is thought to be good for the dental hygiene of your dog. And they can also help to stop your dog from chewing other things they’re not supposed to, of course, if they’ve got a nice, tasty bone to chew on instead! Another benefit of putting your dog on a raw food diet is that it puts you in complete control of what your dog’s eating. You’re not relying on commercial pet food, which may not be as safe and healthy as you might think. Indeed, there have been several recalls of pet food in recent years. And you can be sure that there are no artificial ingredients or preservatives in your dog’s food when you feed them a raw food diet. Finally, the raw food diet can work out to be a much cheaper way of feeding your dog than other, more conventional methods so you can also save money this way too. AAFCO (the Association of American Feed Control Officials) dictate standards that commercial pet food manufacturers must adhere to. This isn’t true when you’re feeding your dog home-made food. So the onus is on you to make sure your dog gets a balanced diet, something that’s more difficult to achieve with a raw diet. When you cook meat, the heat kills any bacteria and parasites. The heat used in the manufacturing of commercial dog food does the same thing. But when you feed your dog raw food, this isn’t the case. Some dog owners freeze the raw meat before feeding it to their dogs. Although this can reduce the amount of parasites significantly, it doesn’t necessarily remove them completely. Indeed studies have shown raw food diets may contain such nasties as salmonella, e-coli and campylobacter among others. Another disadvantage is that if your dog does eat meat containing these parasites and bacteria, you can also be exposed to them through your dog’s poop. This is normally only a concern for people with immune problems, young children or the elderly, but it’s definitely something to take into consideration if your family includes such people. While the idea behind the raw food diet for dogs is that it’s like the natural diet of wild dogs, many of today’s dog breeds are no longer anything like wild dogs. They’ve been bred to have certain characteristics and some of them are liable to suffering from nutritional imbalances. If you’re including bones in the raw food diet for your dog, there’s also the potential for them to break their teeth on the bones, or even choke on them. Finally, it can be more inconvenient to feed your dog a raw food diet. It takes longer to prepare their meals, for example. It’s also more difficult if you travel a lot. This is true whether or not you take your dog with you. If you leave them behind, someone else has to know how to feed them their diet. And many kennels will charge extra for providing a raw food diet for dogs. And if you take your dog with you, you need to store their raw food somewhere. It can be hard to find hotels, etc. that will store raw food for you. There are pros and cons to the raw food diet for dogs, which we’ve discussed in this article. Unfortunately, there’s not been too much scientific study carried out in this area, so it’s hard to say for sure whether the pros outweigh the cons or vice versa. It’s ultimately down to the individual dog owner to decide what’s best for their own dog’s needs. I do recommend you speak to your vet before making any decision about starting your dog on a raw food diet. And if you don’t opt to follow this method, make sure you give your dog only the best quality dry food rather than any cheap rubbish filled with additives, artificial flavors and other nasties.